This site remains in tact for historical purposes only. Dmitry Sklyarov is a Russian Ph.D. student who was arrested at DefCon 9, a security convention in Las Vegas, Nevada, USA on July 17. 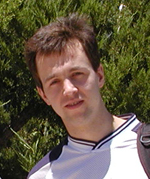 Dmitry authored software that allows legitimate purchasers of eBooks to convert those eBooks into a more Portable Document Format (PDF). The software enables eBook owners to print their ebooks, and to view them on other computers. The software also makes it possible to use text to speech software so the visually impaired can have their eBook read aloud. In fact fair use rights to obtain and use a wide array of information are essential to the exercise of First Amendment rights. The very vibrancy of our democracy is dependent on the information availability and use facilitated by the Fair Use Doctrine. The time, in my view, has come for the Congress to reaffirm the Fair Use Doctrine and to bolster specific fair use rights which are now at risk. Recently, Dmitry presented what he had learned about the Adobe eBook format at the DefCon security conference in Las Vegas. Unfortunately for Dmitry, his presentation embarrassed Adobe Systems by pointing out the week security used in the eBook format. Dmitry was probably unaware that his software and presentation violated the controversial Digital Millennium Copyright Act (DMCA). Adobe Systems filed a complaint with the FBI and alerted them of his attendance at the Las Vegas Convention. The FBI arrested Dmitry the day after his presentation on charges that he violated the DMCA. Although Adobe Systems has withdrawn their complaint and asked for the release of Dmitry, he is still being detained in the U.S., and unable to return to his family in Russia. He faces 5 YEARS in prison and a $500,000 fine for his software and presentation. Personal actions include continued petition signature gathering and day of letter writing. EFF alert and letter templates can be found here. Keep watching the web site for updated information when scheduled. "Steal This Session: The DMCA Great Debate"
Note: This is paid event part of Seybold (info). We're listing it because we think it's of potential interest to the community. This does not construe an endorsement of any kind. "We were hopeful that the government would see the wisdom and justice in not pursuing a case against Sklyarov," Burton said. "Even if one were to ignore the serious legal questions involving the (copyright protestions), this case hardly cries out for criminal prosecution. Sklyarov's and ElcomSoft's actions are not conduct that Congress intended to criminalize." 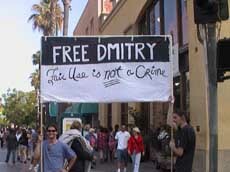 Join the	Los Angeles Free Dmitry Announcement List to receive announcements of local	LA events. (low volume). Join the Los	Angeles Free Dmitry planning list to actively participate in event planning and strategy discussions. (Healthy volume). Join the International	mailing list (EXTREMELY HIGH VOLUME). The group who met with Adobe Systems and convinced/pressured them to drop their support for the prosecution of Dmitry. The convention where Dmitry presented his findings, and where he was arrested by the FBI. Congressman Rick Boucher (D Virginia) urges reaffirmation of fair use rights. The complete local Los Angeles resource collection begun by Bob Smart and Mark Bilbo, is being temporarily hosted by la.freesklyarov.org because Bob and Mark's DSL provider died. Full collection can be found here. Thanks for the help guys. It's quite a task to maintain this site while working a full time job. Instructions for bumper stickers including where to buy materials and how to make them at home bumper stickers.